The future of the International Space Station is a little clearer this week, following a statement from Russia supporting an extension of the orbiting complex through 2024. The move aligns the Russian Federal Space Agency, Roscosmos, with NASA—which already said it would continue station operations through the same period. The International Space Station is viewed from Space Shuttle Atlantis on July 19, 2011 during the shuttle program's final flyaround inspection. Following a meeting of the Roscosmos Scientific and Technical Council, or NTS, a statement was released describing a plan to add new modules to the ISS but then remove them around 2024 to create a new Russian space station. "The concept involves the use of the ISS until 2024,” said a translated version of the statement, “and then to create a Russian space base on the basis separated from the ISS modules." In a statement provided to The Planetary Society, NASA’s response was measured and did not mention Russia directly. 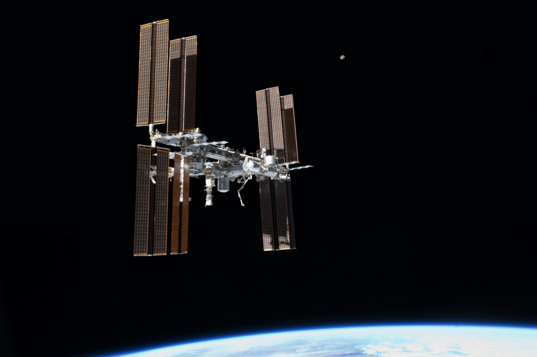 "The Obama administration is committed to extending operation of the International Space Station to at least 2024,” NASA said. "The space station is providing a unique environment for human health research and space operations that will be necessary for conducting human missions deeper into space and for expanding commercial activity in low-Earth orbit. We welcome continued cooperation from our ISS partners in support of this extension and look forward to working with them on the ISS until at least 2024." Until now, NASA was the only agency that had signaled it would keep the station operating beyond 2020. A decision on continued involvement from Europe, Japan and Canada may not come until next year. Roscosmos’ plan to add new modules to the ISS has been stymied by a series of technical setbacks. This week’s statement specifically mentions the long-delayed Multipurpose Laboratory Module, or MLM. It also mentions a "nodal module (UM) and scientific power module (NEM)” that will be used to "create a promising Russian space station to meet the challenges of providing secure access to the Russian space,” said the translated statement. Before 2024, at least some of these modules would be installed on the ISS before being separated to create the new Russian station. The statement does not specifically say whether all three would first be launched to the ISS, nor does it give any details or timelines. Currently, the ISS relies on Russian Progress vehicles to boost the laboratory’s orbit, which degrades over time due to atmospheric drag. Progress vehicles dock to the Zvezda module at the aft of the station. Russian involvement through 2024 implies this method will continue to be the way the station remains in orbit. Progress vehicles are also the only current way to de-orbit the ISS. Weighing more than 400 tons, the station will be the largest object ever brought out of orbit. NASA has previously indicated a desire to extend the station’s lifetime to 2028. If Russia abandons the station in 2024, NASA would either need to secure additional Progress flights, or look for alternatives. The Roscosmos statement also said the Russians would aim for crewed moon landings around 2030, but no further details were given. This is great news. Russia would probably want a space station with a high inclination orbit, to better serve Russia with its high northern latitiudes. The ISS, with whomever international partners remained, along with perhaps adding India, could be nudged to an equatorial orbit which would be better for helping with missions to the moon and interplanetary space. Hopefully, the nudging can be accomplished slowly with an ion drive, which could also be used for station-keeping.